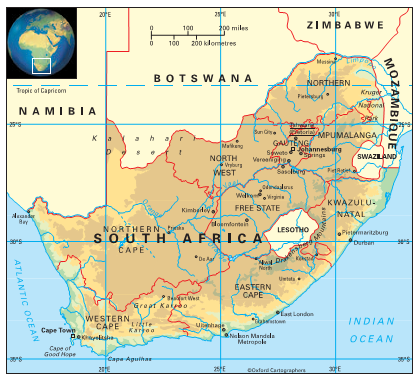 The Republic of South Africa has land borders with Namibia, Botswana, Zimbabwe, Mozambique and Swaziland. Its sea borders are with the South Atlantic and Indian Oceans. Lesotho is enclosed within its land area. The country comprises nine provinces: Eastern Cape (provincial capital Bhisho), Free State (Bloemfontein), Gauteng (Johannesburg), KwaZulu-Natal (Pietermaritzburg), Limpopo (Polokwane), Mpumalanga (Nelspruit), Northern Cape (Kimberley), North-West (Mafikeng) and Western Cape (Cape Town). Climate varies with altitude and continental position – Mediterranean climate in the Western Cape; humid subtropical climate on the northern KwaZulu-Natal coast; continental climate of the Highveld; and arid Karoo and Kalahari fringes, with a great temperature range, giving very hot summer days and cold dry nights. The south-east trade winds, blowing first over KwaZulu Natal, are the principal source of precipitation, falling in summer. Winter rains reach the Western Cape. The most significant environmental issues are soil erosion, desertification, air pollution and resulting acid rain, and pollution of rivers from agricultural run-off and urban discharges. In a country with relatively few major rivers and lakes, extensive water conservation and control measures are necessary to keep pace with rapid growth in water usage. 52,386,000 (2012); 62 per cent of people live in urban areas and 34 per cent in urban agglomerations of more than a million people. The population growth rate stood at 1.6 per cent p.a. between 1990 and 2012. In 2012 the birth rate was 21 per 1,000 people (38 in 1970) and life expectancy was 56 years (53 in 1970 and 61 in 1990). ‘coloureds’ include descendants of slaves brought from Malaya, Indonesia and Madagascar, and the Khoi-Khoi people of the Cape. There is also a substantial flow of inward migration of people seeking employment, most from neighbouring countries such as Lesotho, Mozambique and Zimbabwe. South Africa is classified as an upper-middle-income economy by the World Bank.